When we buy a disk from the market, be it a pen drive or a hard disk dive, which are meant to be used as a portable disk, usually comes with msdos file system. In this tutorial, we shall learn how to mount such a disk as a permanent storage. A storage mounted on a specific location on system boot. We used Raspbian as the OS for this tutorial. If you wanna mount an external drive as it comes out of the box without formatting and keep it compatible with your windows system you can use this article. Above command shall list all the attached block device. In this case you can identify the disk looking as the disk label or the disk size. However the next command shall allow you to see all the disk connected visa USB. Assuming, you dont have more then 4 external disk connected to the Raspberry Pi. Once we have identified the disk we want to use, we shall run fdisk that drive using the following command. In this case it is “/dev/sda” a 250gb usb drive. Once we have identified the newly attached disk, we shall crate an ext4 partition in place of the existing one. We can just re-label it, however if we have multiple partition, we shall need to delete the old one and re-create the new one and set the partition type to Linux . 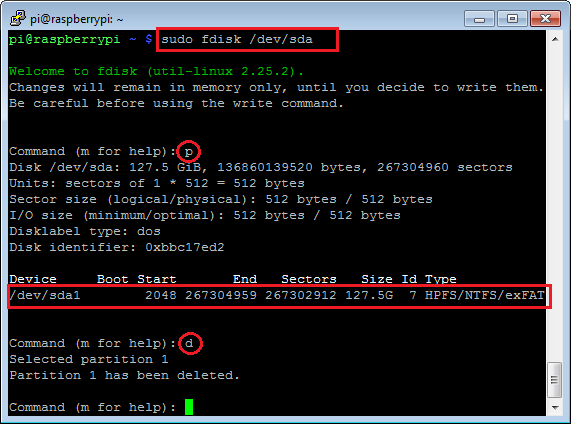 pressing “d” inside fdisk the command line shall delete only partition /dev/sda1. 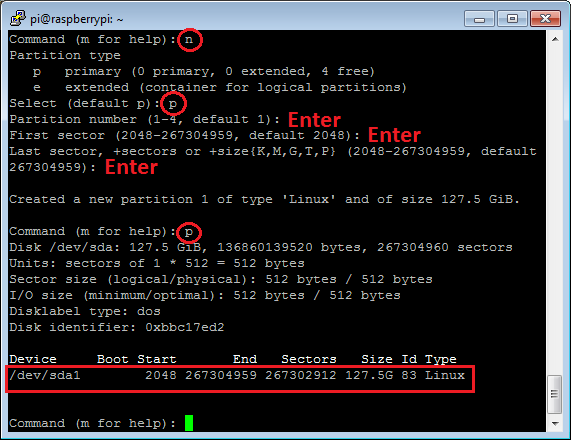 Is there are multiple partition, it shall prompt for the number of the partition. Once asked for the confirmation press "y"
This may take a while to complete, depending on your disk size and speed. To mount this newly created partition create a mount point and add an entry in /etc/fstab file for mounting on boot time. Finally we shall make a list of block device with all the mount points to confirm the chances we made with the following command. alternatively you may also use the following command to confirm to check the file system and mount point etc. awesome. exactly what i was looking for. for some reason on copy paste, the character ‘-‘ would be replaced with ‘.’ in my putty terminal. but it could just be my settings.